Chrome Exposed Retainer Waste - Only £29.99! In stock now for only £29.99 including VAT! Hurry while stocks last! Designed for installations where the waste and overflow is visible, this is specifically designed to look great with any freestanding bath. With its flawless chrome and timeless design, this is built to stand the test of time. This great value, high quality chrome coated standard bath waste is constructed in the very finest brass and manufactured to the very highest standards. The superior quality of this item is reflected in the outstanding 10 year guarantee provided as standard. This superb waste is an essential addition for the installation of any bath. 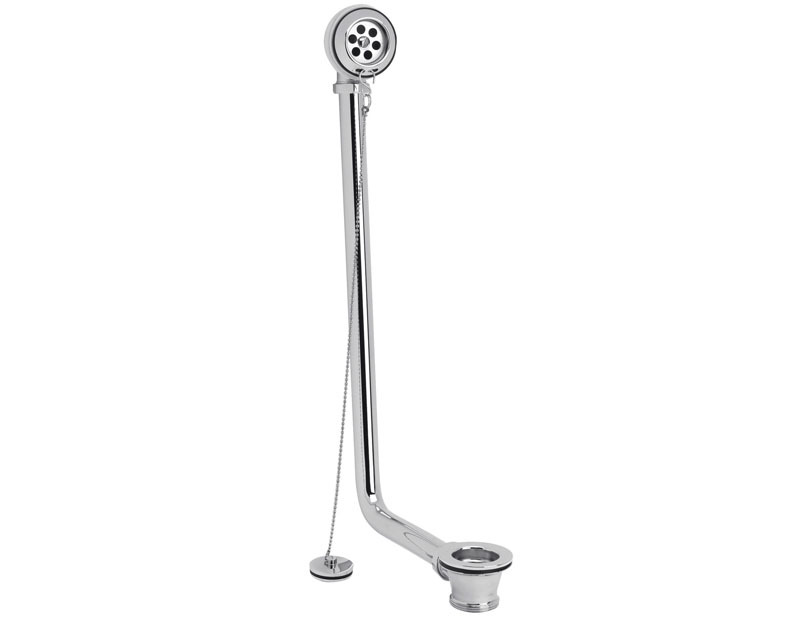 This Chrome Exposed Retainer Waste is the ideal addition to any freestanding bath. This superb bath waste kit is made of brass and coated in chrome. It is ideal for all freestanding baths, including the traditional freestanding baths sold on this website. Because this waste has been designed for bathroom set-ups where the waste is visible, it has been especially made to look good. Incorporating the latest design trends into a traditional yet timeless style, this waste would not look out of place attached to even the most regal and sophisticated of baths. This excellent bath waste comes with a chain and plug, both of which are finished in the same beautifully flawless chrome as the waste. Known for its superb versatility and ease of installation, this is one of the most popular wastes we sell. It is available at a highly competitive price, offering a highly attractive combination of value and quality. It is suitable for all baths up to a thickness of 20mm, which makes it ideally suited to freestanding baths which tend to have a much thicker outer shell than standard type baths. This is an extremely reliable, tried and tested trap which comes highly recommended by our customers - this is thanks not only to its superior build quality but also its highly competitive price. This bath waste is increasingly popular thanks to its highly competitive price and its reputation for being extremely durable and reliable. This waste can be found in thousands of homes throughout the UK.